I've run into an odd bug with the Size 4 ROMBOID aeroplug engine. I'm trying to use it as part of a reusable booster, but it's not working properly at all. When I get to the launch pad, and before I touch anything at all, the visual effect is already going. When I hit the spacebar to fire up the rocket, the rocket just drops to the ground and fuel starts draining from the tanks. No actual thrust, though. I'm sure I've come across this before, but for the life of me can't remember what caused it. Which size is that? The 5m? I'll double check what's in the mod. If that's the old mu file with new cfg file, then it would be clear what's happening to me. ... that IS what's going on. And realized I can see the issue right there in my master copy. That mu file has the old thrust transforms for the flames, but I changed the cfg so those are only used for effects, with the thrust physics effect being based on a single (and less CPU killing) transform in the middle, which will be missing from that mu. The cfg file does the rescaling (and I should move them all into one folder to avoid this type of daft mistake yada yada) so you can copy the NewModel.mu file from the Parts/Mk2to3/Rengine/ folder to the Mk3to4/Rengine. I'll also update the mod. OK, testing shows that explains the missing thrust, but NOT the "let's have flame effects with zero throttle". I have to head off to work. There's a github 1.0.7 (tga files instead of dds, not cleaned up, maybe dev parts etc) that gets thrust back, but doesn't fix the effects effect. OK, updated the spacedock (and thus also ckan) edition, plus the github release. The other issue was just rushing the config change from moduleEngines to moduleEnginesFX, and skipping the link to the effects. Exactly what the issue looked like. I also spotted the surface effects weren't linked to the actual thrust transform and fixed that. And the smoke generation is now larger for the larger engine. Just a quick note. As I moved a copy of my ModPod props into the NAR MEM mod, and was basically running with two copies, I've created a new mod with just the shared prop assets and will mark that as a dependency going forward. At the moment everything still points at the mod-local prop assets, but once netkan updates to include the props, I'll mark it as a dependency, then update the two mods to point at the new(ly renamed) props. Non denominational End of Year festive season message. The last couple of months have been a bit of a mad house for me iRL. I've been on Jury Duty with a long case that made me appreciate jury service more, but also would rather have skipped. My 20 year old cat has passed away, but me and my wife and I have embarked on bringing up a puppy and kitten (and I'd like to sleep again now). We had a long standing plan on replacing the carpets when the old cat passed, and so I then moved all our furniture off the carpet, had it replaced, and am slowly (cos I'm now broken from the initial carpet moving) moving stuff back to where it belongs. My mother in law had a stroke and passed away. Which was heaps of not-fun. So, KSP things have been on hold for a bit. Some time soon, I'm hoping for a return to normality, and a subsequent increase in time available for modding and maybe even playing KSP. In particular, I have a few outstanding parts to complete* on the NAR MEM before I move to looking at better integration with other mods like BDB. I need to go through some configs, esp for Space Opera and check heat issues for the converters, 'cos they all became different. 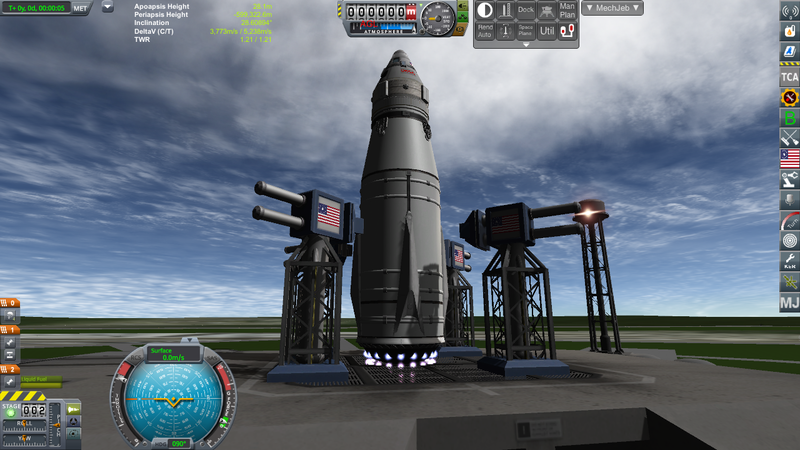 I have some test config that is currently crap, but working to get Rovers updated to optionally use KSP Wheels. and so on. * Complete being, nothing's horribly wrong with it, no parts are untextured, and it's "releasable". Not equivalent to Finished. @TiktaalikDreaming sorry to hear that your recent life has been less than great or even content. Seasonal greetings and peace be with you. "This end up". That's awesome. But the Russians recently proved that even with that label, it doesn't always work the way it's supposed to. When using mechjeb is important you don't shift launch pads without telling it. unless using the Dev build. But yeah, knowingwhich way to point the rocket is fairly important too. I gave this mod a try and I like the models. But there is one thing I do NOT like: Why does this mod mess with the atmosphere? SSTO spaceplanes that can easily make orbit without modpods installed don't stand a chance with modpods installed. Flight profiles were identical and neither flight featured any modpod parts. You might want to check what else you've installed recently, because this mod very much does not mess with the atmosphere. It's a part mod, with no code. It cannot mess with the atmosphere. And that's EXACTLY why I am baffled too. Before ModPods: plane works fine. Install ModPods: plane fails miserably. Remove ModPods: plane works just as before. Re-install ModPods: plane fails again. Nothing has changed except ModPods. Something in ModPods is messing up one thing or another. Drag, thrust, aerodynamics? I'll do some more digging around but for now modpods will sadly not make it into my career game. After more testing and I am sorry to inform you I have not been able to eliminate ModPods as the prime (and only) suspect. I did multiple tests both with and without ModPods installed. I even had MechJeb take full control of the flight just after take-off to eliminate unintentional bias. 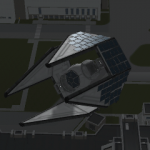 Without ModPods my plane made orbit. With ModPods installed in even failed Mach 1. 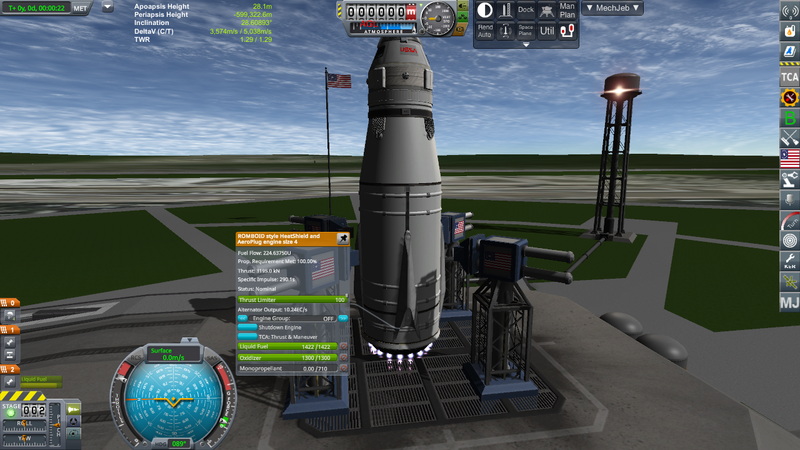 If you want I can send you the craft (Stock + Mk2 Expansion) with detailed flight instructions. Could you send me the ModuleManager.ConfigCache files for with and without ModPods? You'll need to start the game up once in each state for MM to refresh the cache. Also, where are you getting ModPods from? CKAN? Spacedock? Github? I won't touch CKAN with a 2m pole. I am not IQ deficient. 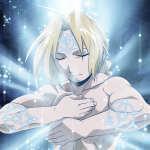 I install my mods manually. I usually download from Spacedock. Pretty sure I got ModPods from there as well. If you want to dig through two almost 3.5MB cache files, be my guest. I'll make them available to you later today. MM configs with ModPods installed are nearly identical. As far as I know all MM adds when ModPods is installed is a few MechJeb modules. With ModPods installed I did another test with a different craft. 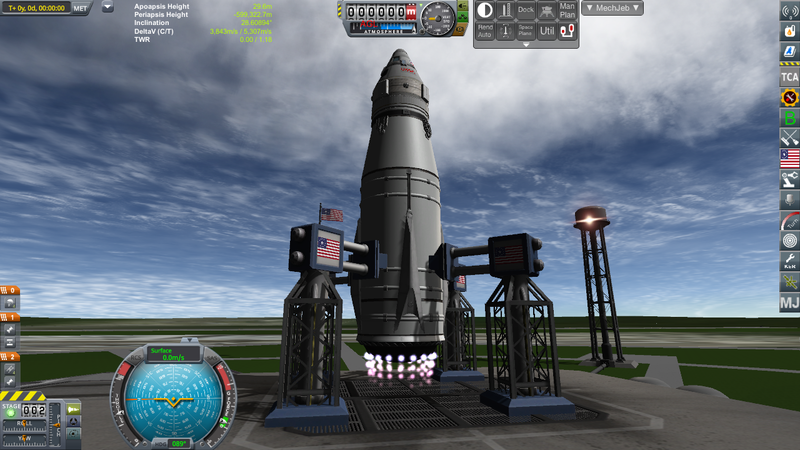 Normally MechJeb launches it to orbit with ease. This time it fell miserably short. But this craft too featured some parts from Mk2 Expansion. I'll see what happens with a 100% stock craft. Same result with a pure stock craft. With ModPods installed the craft performs far below par. Brand new, 100% stock install. Installed ModuleManager, MechJeb (and MechJeb embedded) to make flights as reproducible as possible. Did NOT install ModPods yet! Build a simple 100% stock 2 stage rocket. MechJeb launched it to a 100*100 orbit with 160m/s left. Loaded up the exact same 2 stage rocket. 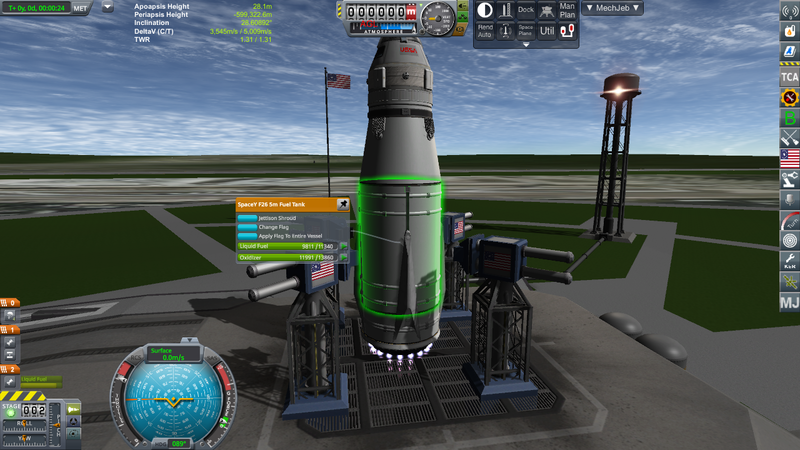 MechJeb launched it under the exact same conditions to the same 100*100 orbit. It fell 310m/s short of making orbit. I am very sorry but I can come to no other conclusion than blaming ModPods as it was the only variable. @Tex_NL I'm not going to comment on your CKAN issue. Then provide both for people to look at. I took a look at the mod and don't see anything in it which would cause your issue, they are only parts with no ModuleManager entries at all. Have you read my post BEFORE the one you quoted? Clearly you did NOT! Please do that first. THEN we can talk! In the first test I DID provide those MMconfigs. In the second test there were NO OTHER MODS that could cause this. ModPods was THE ONLY variable that changed. If you are going to be rude, then you won't get help. I work with a lot of mods, and don't have time to read every post. Your post caught my eye in my email, so I responded. Because that was not asked for. I can certainly see how you come to that conclusion. I'm just struggling to see how that could be the case. So, coming at this from the point of view that *something* is going on, and that ModPods is purely a part mod (there's not even any MM code), then the only mechanism I can think of is a part overwriting some other part. But then I'd expect to see that in the diffs. So, I'm a bit baffled. To isolate it a bit further, could you try deleting the TDProps folder? Your IVAs will be a bit empty, but it might narrowdown what's going on. Props *really* shouldn't be affecting physics. But neither should parts you're not using. I'm starting to wonder if there's something the game is doing different if there's more than X amount of texture loaded or transforms or ... fiik to be honest. Oh, and what about your system? Windows, MAC, Linux? And what flavour of said options. And the next most significant impact, how much RAM has the system got? And, (if Windows) are you running the 32 or 64 bit version? Also, if anyone else is having similar issues, please "me too" the thread. Do ModPods have custom defined Dragcubes? Improperly configured DragCubes can result in (sometimes substantially) more drag, which would adversely affect performance in atmo. Maybe it would help to narrow down the symptoms a bit more. The test cases so far consist of entire launches, which could be affected by many factors such as differences in wet mass, dry mass, ISP, part drag, engine thrust, atmospheric pressure, etc. I know that KER has (or had?) a panel that shows many of those key values; does your MechJeb have such a view, and if so, are any of them different across your tests? What about the F12 atmospheric forces overlay? He's not using the mod's parts, though. Found it. It's an incorrectly configured ModuleDeployableAntenna on the Mk3 to 4 Service module. I'll check that out, but seeing as @tex_nl isn't using the part, it shouldn't interfere. I am however appreciative of people finding errors.